There are some positions, Teaching English as a Second Language in China, opening each year for native speakers of English at the Wujiang Taihu International School, Wujiang City, Jiangsu, P. R. China. Taihu Great Learning Centre has been master Nan's dream for many years. Construction was started six years ago in an area of about 200 acreage. The area is located about 110km south-east of Shanghi and on the shore of Taihu Lake about 70km south of Suzhou . ducks and the moonlight reflecting off Taihu Lake during the evening. Taihu Lake itself is 36000 hectares. There are three large buildings in Taihu Centre, the main one is the administration building and the others are for accommodation and an auditorium. 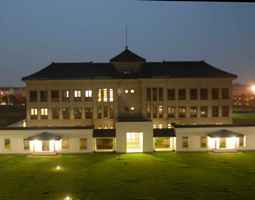 The administration building includes an office, library and a lobby. The first floor of the accommodation building is the dining hall catering for about 100 people. The second and third floors are rooms similar in style to five star hotels. The first floor of the auditorium is used for lecturing. The second floor is a meditation hall large enough to accommodate 200 people. Conditions inside the hall (air, light, sound, temperature, etc) are strictly controlled. It is the first of its kind in the world. This building is a huge technological step forward for Chinese Zen culture.  Taihu Centre has contracts and cooperates with local and overseas universities and cultural groups.  Now they are contributing to the research and promotion of traditional Chinese culture. And they are focusing on promoting the importance of social and young children's education.  They approach the concepts with an open mind and use modern technology to understand the substance and essence of eastern and western cultural science and humanities to achieve mastery through comprehensive study of these subjects.  The most important thing in religion and culture is study and understanding so the centre doesn't hold any religious events. Since July 2006 many events have been held at the centre and the centre is affiliated with six higher-level learning institutions.  The National Chinese People's University. 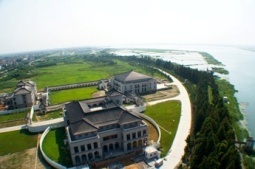 Wujiang Taihu International School is a boarding school from K-9, located next to Tai Lake an hour drive from Suzhou. The campus is located in a quiet area with beautiful surroundings including a dormitory built with environmentally friendly materials. Students are free to learn and grow in this natural and comfortable environment. The main teaching techniques are based on a combination of European outdoor and experiential methods and the systems thinking approach from America, leading to more open-minded style of education. Wujiang Taihu International School also includes Master Nan's teaching concepts on humanities. We believe the curriculum will be very beneficial to single children living in large cities.  Combine traditional Chinese education with western experiential education.  Use knowledge gained through life science to practice the spirit of humanity. Program combine physical, mental and spiritual aspects to form a learning environment where we educate kids to be open minded, healthy, have good ethics and get a good academic education.  Teamwork: The participants will learn from experience to achieve their goals as a team as well as personal growth.  Learning by Doing ： Provide a healthy environment where students can learn about themselves and develop a strong character through their experiences. (3) Focus on ethics education, human empathy, traditional culture & outdoor education. (4) Kids develop foreign language abilities & develop a broader understanding of the global community.  Healthy Living: Students will study simplified Chinese medical theory in order to eat healthy diets and lead healthy lives.  English Program: In cooperation with the education department of Columbia University a curriculum has been written to develop students' global understanding and awareness. It focuses on the humanitarian development of students.  Traditional Chinese and English reciting: Every student will learn to recite 10 Classic Chinese texts and 60 English analects.  Regular Classes: Traditional government subjects. (2) Outdoor Education Class: Natural (plant, Animal), Environmental and Physical training classes. (3) English Class: Reciting, Music and Conversational Classes. (4) Culture Class: Traditional reciting and humanities. (5) Spiritual Education: Meditation, Calligraphy and Etiquette. (6) Extracurricular activities: We will work with international educational organizations to set up learning centers of different subjects and styles, so students are free to select open-style lessons. (7) Special Activities: Once a week-Outdoor Program, Once a month-Combined Curriculum Class, Once a semester- 3 day Experiential Education Camp. The members are from Europe, USA, Japan, Taiwan and China. The director is Master Nan Huaijin.  During the weekend or vacations students can choose to return home or remain at school.  We help students to learn how to complete daily chores independently.  We provide a safe and supportive environment for students to adjust to communal school living.  Students learn to take responsibility for themselves. Fall 2009 we open K-G4. Each year one more grade will be added. Currently we are accepting G1-G3 transfer students from other schools.  Native English speaker who got the diploma certificate or Bachelor's will be paid RMB4,000. CELTA, TESOL will be paid RMB5,500.  Native English speaker who got the Master's degree with the pertinent certificate such as ESOL, CELTA, TESOL will be paid RMB6,500. If the foreign teacher who got the Master's degree without the ESOL, CELTA, TESOL will be paid PM500 less than the certificate holders.